EDITOR’S NOTE: This piece contains our thoughts on some of Aldi’s tents and outdoor bedding products, continuously updated for 2019. To see our thoughts on Aldi’s backpacks and accessories, click here. When late spring rolls around, you can be sure that Aldi will start rolling out the camping gear. We’ve collated our thoughts on several tents and options for outdoor bedding. An important note: while this post deals with products sold in the United States (and our product listings use U.S. dollars), some of these products do appear in similar or identical form in other parts of the world, including Australia and the United Kingdom. Whether you’re from the United States or from other parts of the world, we’d love to hear your own thoughts and experiences in the comments. Thoughts: Sometimes simply called the Adventuridge Dome Tent, this tent is manufactured by Wenzel, which makes a variety of tents, most of them with decent reviews. The Adventuridge 8-person tent uses a tried-and-true modified dome style that takes, in our experience, about 30 minutes or so to set up and take down. If you’ve worked with this style of tent before, you probably won’t need to look much at the manual. A couple of nitpicks. First off, as is typical for tents nowadays, we don’t know that it really fits the eight people it claims to unless you’re cramming them in like sardines. With a fair amount of gear, this is more suitable for, say, four people. Second, two of the guy lines from the fly stake down in front of the door and are a tripping hazard, especially at night, so some reflective tape wrapped around them (or perhaps cut pool noodles) might be a good idea. We also recommend buying a good tent sealer to help keep the rain out. That said, we think this is a solid tent for a family trip, and the price is about as good as we’ve seen for a tent of this size. It’s also backed by one of the longest warranties we’ve ever seen in an Aldi product: 10 years. Thoughts: Another Wenzel tent, this tent comes in blue or green and uses the standard dome style common to tents of this size. Setup is straightforward, and little extras like an e-port and a zipper cover on the D-syle door are a plus. 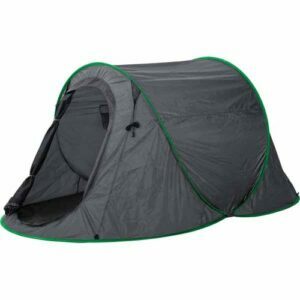 It is listed as a 4-person tent, but in our experience tents of this size are best suited for two people. We’ve tested it, and while it’s got some limitations, it’s a good budget tent. Like the 8-person tent, it comes with a 10-year warranty. Thoughts: This tent comes as a large disc that, according to the instructions, you simply toss into the air and it pops into place. The price is considerably less than most other pop-up tents, although the 2018 model is $5 more expensive ($24.99) than the 2017 model ($19.99). 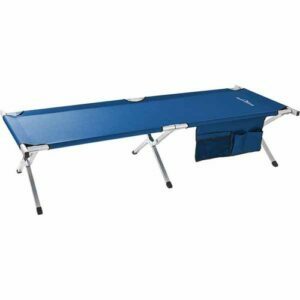 It measures 96.5″ x 57″ x 43.3″ and is designed for one person and some gear. Given what we know about other Adventuridge tents, we figure this one is worth a look, although we’re not sure who the manufacturer is. Thoughts: Measuring 74 inches long, 26 inches wide, and 2 inches tall, this mat is manufactured by German-based company Royalbeach. More portable than an airbed or cot, but also less comfortable, this little device quickly and automatically fills with air when you unroll it. We found it easy enough to use, although it only — like most camping mats — provides a small amount of cushioning and insulation against cold or damp ground. As far as self-inflating mats go, this is about as cheap as it gets, although the 2018 version ($19.99) is $5 more than the 2017 version (which was $14.99). It comes with a 2-year warranty. Thoughts: This is the companion to the self-inflating mat, although it can be used on its own merits with a cot or airbed. Like that mat, this is very compact and inflates automatically when you uncoil it. We’ve tried it, and while it’s no true substitute for a real pillow, we got a decent night’s sleep with it. It’s reasonably comfortable and probably necessary if you get the mat, unless you want your head flat on the ground. It has a 2-year warranty. Thoughts: Like the inflatable mat, the cot is manufactured by German-based company Royalbeach. It measures 75 inches long, 24 inches wide, and 17 inches tall and sits on an aluminum frame with a 265 lb. weight capacity. The cot comes with a side storage pocket and the whole thing folds into a carry bag. Cots are one of our favorite sleep surfaces for camping, but they’re also the heaviest when folded up compared to mats or airbeds. This one is no exception; while it’s reasonably compact when folded, it’s noticeably heavier than the mat and airbed. On the upside, it feels stable and is relatively easy to assemble. It has a 2-year warranty. 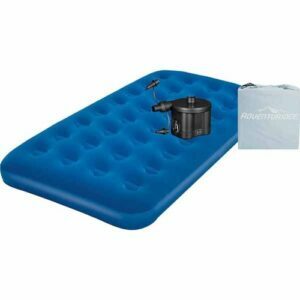 Thoughts: A standard single-height queen airbed, suitable for camping or other travel where you need temporary sleeping arrangements. In our experience, airbeds have the best mix between compactness and comfort, but even a pinprick-sized hole can be an annoyance. Our preliminary thoughts on the Aldi airbed are decent enough, and the price is lower than even some of the generic big-box store versions we’ve seen. The pump is a plus, although we’ve filled many an airbed using just a standard hair dryer. It also comes with a carry bag for the whole thing. 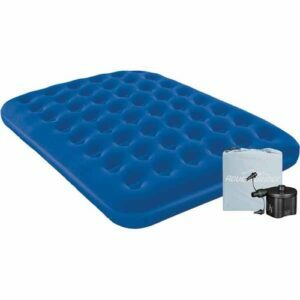 The airbed has a 90-day warranty and the pump is guaranteed for 1 year. Thoughts: essentially a smaller cousin to the queen airbed, it includes the bag and air pump the larger version does. If our experience with the queen is any indication, this is a solid choice for an airbed for one. 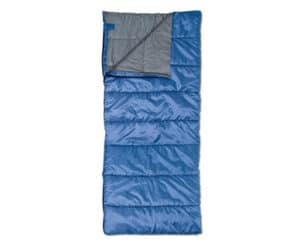 Thoughts: Manufactured by Australian-based Companion Brands, this sleeping bag comes with a self-repairing zipper, a full length wind baffle along the zipper, an internal pocket for valuables, and optional foot ventilation. It’s rated for 35-45 degrees Fahrenheit and includes a carry bag. It’s backed by a 2-year warranty. Thoughts: Measuring 9 feet long by about 5 feet wide, the featureset includes Heavy-duty rope and steel carabiners for what it claims is quick and easy setup. It stores very compactly in a provided bag. 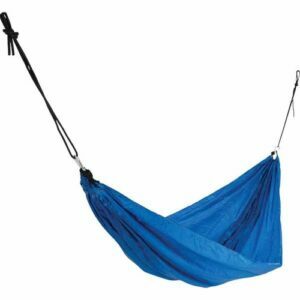 The retail price is considerably lower than other travel hammocks online, although the price of the 2018 model is slightly higher than 2017 ($14.99 to $12.99). It comes with a 2-year warranty. We’ve interacted with some of these products, and the ones we have used have proven competent. We like the warranties on many of them, especially the larger ones. Either way, we’d love to hear your thoughts in the comments. I was just looking at their camping gear thinking that the single pop-up tent might be something my son would like. In the end I got some beautiful Petunias in hanging baskets for $4 a piece. last update, it rained last night. not pouring but not sprinkling and for quite some time. no water in the tent but we also had all the windows zipped up. but no leaks and a good sound proof tent. I forgot to include there is a extension cord pocket up front so you can put it through the side without water or bugs getting in and it doesn’t have to be at the opening near your feet to trip over. a nice little extra. A useful update all-around, both with regard to rain and the e-port. Thanks again for sharing. Am in need of another camping floor mat. They should be in your Aldi stores now. DISH DRAINER. . . I bought the Adventuridge Collapsible Tub / Dish Drainer at local ALDI in the Bronx, N.Y. about 3 weeks ago. It is excellent. I only paid 9.99. Can’t get them now. Wish I could find another one. If you see one , buy it. How is ventilation in the tent? We live in Missouri with miserably hot summers…but we love to camp. 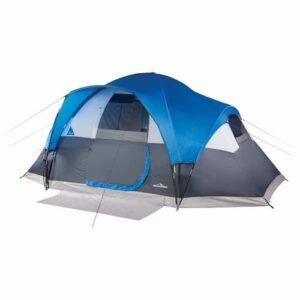 The Aldi 8 person dome tent is on sale right now (possibly because other people in Missouri know better than to camp this time of year) and I am excited to know it is a Wenzel, which are good car-camping tents that often cost 3-4 times what this one does. But how are the windows and general ventilation? For what it’s worth, our experience with the tent happened at Bennett Spring State Park in Missouri, in the summer, and we thought it ventilated pretty well. In our experience, the drawback of the tent is that the fly is short compared to, say, a Coleman. In a heavy rain, especially with wind, the rain gets in through the windows. Another brand worth checking out is roadeavour. I got the swag they had and it was about 100 dollars. I have another one that is an oz trail brand but this one is bigger. It is actually the exact same swag as the oz trail king which sells for anything up to 400 dollars. They are made in the same factory and are infact the same swag. Even the writing on the side is the same just the different name. A friend of mine has the oz trail king and we compared them and they are the same swag. Very good quality and for a 100 dollars it cannot be beaten. VERY impressed. Wait, to which swag are you referring? The 8-person tent? It was only $80 here in U.S. I did think it looks like *exactly* the same as the Ozark Trail one at Walmart, just with a different name. Tents – I have the 4-person and the 8-person tent. They are both sturdy, well made, easy to set up and take down, and well ventilated. I especially like the waterproof “bathtub floor.” I never buy tents that don’t have this feature, as I don’t want to bother with a separate ground-tarp or water coming in at the floor seam. I have two slight complaints with the 8-person tent. One, The rain fly does not extend over the windows sufficiently. If it is raining, you’ll need to keep the windows closed completely. (You will still have ventilation through the top, but you won’t have a view of the outdoors.) Second, the “room divider” is completely useless. It’s short, it’s virtually transparent (thin and white), and it doesn’t even line up to the places you’re supposed to fasten it. And just fyi, it only sections off one of the small ends/sides of the tent; that is, it does not go down the middle of the taller middle section. This was not a deal-breaker for me because I probably wasn’t going to use it anyway. It’s still a nice, roomy, good tent at a fantastic price. I set it up in my backyard and put my Aldi hammock in it (The instant-set hammock with the metal folding frame, that is, not the one that you tether to trees) and it makes a great place to relax. It will also be good for car-camping (not backpacking) and can sleep three people with cots and gear comfortably. The small tent is nice, too, and I will probably use it for backpacking for one or two people. I bought the cot, two of them in fact, but ended up returning them. Once set up they are very comfortable cots, and the side pouch is very handy. But, the last step of setting up , where you pull the last end bar into place, can be VERY difficult. In fact, of my two cots, I could only get one set up. The second one, I simply could not pull that last bar into place. I’m an adult female, not particularly buff, but I’m not weak, either. So the hassle of setting up the cots was one strike against them. They are also a similar hassle to pack back up. The cots are so heavy that they are clearly only for backyard or “car camping” use. You would never take them backpacking. Thus, the fact that they fold down into a bag is not a useful feature at all. If it were a lightweight item that I could take backpacking, then it would be great for it to roll up into a bag for ease of packing. But, since I’m putting it in my car, fitting into a bag doesn’t matter. Hassle of set up and tear down DOES matter. I ended up buying a Field and Stream cot that folds up like a lawn chair. https://www.fieldandstreamshop.com/p/field-stream-camp-cot-15fnsufscmpctxxxxcsl/15fnsufscmpctxxxxcsl It takes literally less than ten seconds to set up or to tear down. It is a little pricier than the aldi one (regular price $40, I got it on sale for $30), but it is soooo much more convenient that it was worth the price to me. Sure, it doesn’t roll into a bag, BUT it folds flat, so while it is bulky, it is thin, and easily slides into my car on top of or beside my other gear. For extra comfort, I use my ALdi Adventuridge self-inflating mattress on top of the cot. Adds a little cushioning plus insulation from the cold. This mattress is a little thin if it’s your only bed, but on top of a cot it is great! The mattress is also great for backpacking, where you trade off comfort for the lighter weight. And the price is GREAT!! We bought 2 of the pop up tents and I am SUPER disappointed in them. They have been set up less than 5 times each and both are completely unusable. The first 4 times they were set up inside of our house to test out various sleeping arrangements (small cot vs air mattress vs sleeping pad etc) and the final time was the one and only night we actually slept in them outside. One tent’s fiberglass poles were snapped as soon as it popped up (but we were able to stabilize it enough to sleep in it for one night). The second worked beautifully when it popped up, was able to sleep 1 adult and 2 small kids on sleeping pads). The next morning the fully functioning tent folded pretty easily and fit exactly like it should in its carrying bag. All our gear was loaded into the back of our truck and the tents were placed on top with nothing on them or against them and the load was covered with our tonneau cover for an 8 hour drive. When we unloaded at our destination, the functioning tent’s bag was no longer round and was being stressed at multiple points from the fiber glass poles snapping in multiple places. We have owned multiple pop up items (from small play tents to other actual camping tents) and have never had a problem with any of them until the 2 we got at Aldi. Got the self inflating pillows on sale for $1.99 each. Great for having around the campsite for sitting on rocks. Also got three single blow up mattresses for $10 each. At the wise counsel of my brother, he suggested we each get separate mattresses rather than get a full/queen size to share. That was the best decision we made! Wondering how their YETI knockoff cooler works- almost got one of those too. How does the Adventuridge 4 man tent hold up in windy conditions please? We are due to go to Shell Island in Wales and it is forecast windy with showers. I have an ALDI branded Adventureridge 12V fridge and find it adequate for what it is used for. The insulation may not be as good as my Engel Fridge, it uses a bit more power it cycles across a 5 degrees celcius range between turning the compressor on and off. Is serviced/warrantied by Companion Brands of Aus. Hi, I recently bought the 10 person Adventuridge tent whith lights. It was a great price only $249.00, but when I got it home and put it up to check it out, it had no lights. All the fittings were there, just no lights. I returned it to the Aldi store where I purchased it from and they happily exchanged it for another one. I got that one home, put it up and guess what? No lights again. I’m at a bit of a loss as I now have to take it back and exchange it all over again. Can you offer any advise ? I love the Tent but it was advertised that it came with Lights. 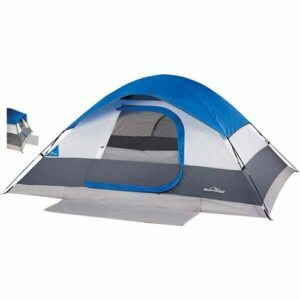 How can I get a new fly for Adventuridge 4 man tent with ext vestibule? There should be support information in the manual that came with the tent. If you don’t have that, your next step would be to contact Aldi at its website. 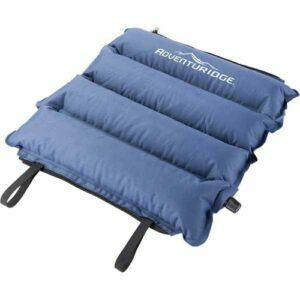 when does aldi usually start stocking their stores with their adventuridge products? i bought some 9×7 tents last year that are pretty decent for the money, so i’m interested in testing out some more of their gear this summer. Last year, the first of the camping gear hit stores around early May, running through at least June. I wouldn’t be surprised to see the time frame be similar here.